Optical illusion is one of the interesting phenomena that we experience because of the complexity and excellent power of the human brain. One of the best illusion is the shadow illusion. See the image below we can notice two color boxes. 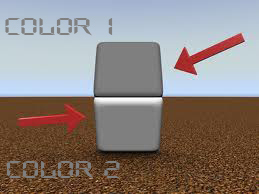 But the truth is that these two boxes are of same color. Now place your hand on the screen where those two boxes meet. What did u see now. Use eyedropper tool from an image editing software. You can realize that both the colors are the same. This effect is called shadow illusion effect. a shadow is considered to be there by the brain itself. So we are noticing it as two separate colors.